Assembly technology products from Tectra Automation enhance productivity, with exceptional versatility in how they can be combined. All our assembly technology products have been developed based on years of experience in product assembly and production line applications. Tectra Automation stocks a range of conveyor and transfer systems from Bosch Rexroth that have been engineered over years of experience in development, production and implementation of product transfer. Bosch Rexroth’s ergonomic manual production systems and ActiveAssist software, enable businesses to enhance the lean production of their operation. Tectra Automation stocks a range of basic mechanical elements from Bosch Rexroth designed for easy installation, long service life and high performance. The Bosch Rexroth VarioFlow plus is the ultimate chain conveyor for assembly lines in food, packaging, healthcare, automotive and electronics industries. Assembly technology for our conveyor and transfer systems range from belt, chain and mat top conveyors to roller conveyors and complete transfer systems. These transfer systems, with their modular design, allow for quick adaption to changing conditions in assembly technology. Basic assembly technology mechanical elements offered by Tectra Automation include strut profiles, EcoSafe protective barriers, EcoShape tubular framing systems and feet & wheels. We also stock accessories for this range of assembly technology and our connection elements provide for quick and easy system configuration assembly. Specialising in industrial and factory automation, Tectra Automation provides pneumatic, vacuum, electric drive and control, process valves and actuators, linear motion and assembly system technology. Tectra Automation supplies high-quality assembly technology products designed to cater to your needs. Our assembly technology product range is supported by a dynamic sales team and technical department to ensure that you receive the best possible service. 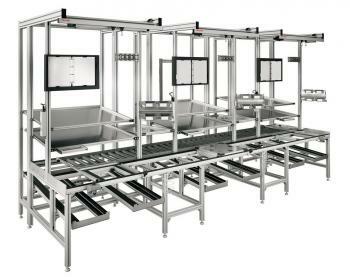 Enhance your product assembly efficiency.Send Tectra Automation an enquiry today!